With ceremonious solemnity last week Secretary of State Stimson and Sir Esme Howard, British Ambassador to the U. S.. signed an official document which added seven specks in the Sulu Sea to the U. S. domain. The specks were the Turtle Islands, southwest of the Philippines and some 20 miles off the North Borneo coast. The U. S. and Great Britain had at last agreed upon a boundary line between their possessions. Under the four-power Pacific Treaty of 1921, the U. S. is prohibited from using its new miniature archipelago as a naval base. FIFTHLY. It is agreed that the United States Government shall be c!~~ fl DOllIe- exempt from responsibility in respect of acts done in or from any of the islands in question the administration of which has not been trans- ferred to the United States. SIXTHLY. 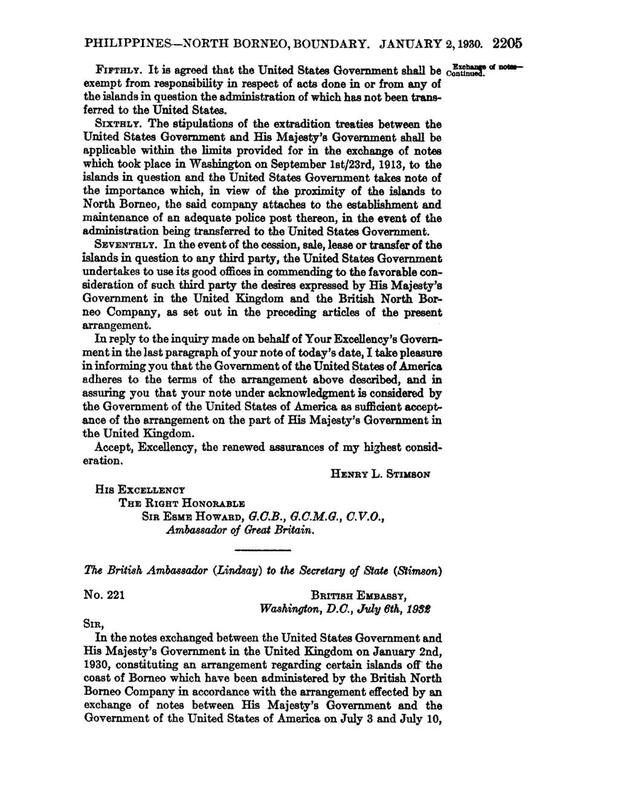 The stipulations of the extradition treaties between the United States Government and His Majesty’s Government shall be applicable within the limits provided for in the exchange of notes which took place in Washington on September 1st/23rd, 1913, to the islands in question and the United States Government takes note of the importance which, in view of the proximity of the islands to North Borneo, the said company attaches to the establishment and maintenance of an adequate police post thereon, in the event of the administration being transferred to the United States Government.